One place that I often rave about for their great happy hour ($5 delicious speciality cocktails and wine, $2 Southern Star Bombshell Blonds and a veg-friendly selection of hearty small plates for just $5) is Benjy’s. For Restaurant Week, both the Washington and Rice Village locations are offering up great options for vegetarians. 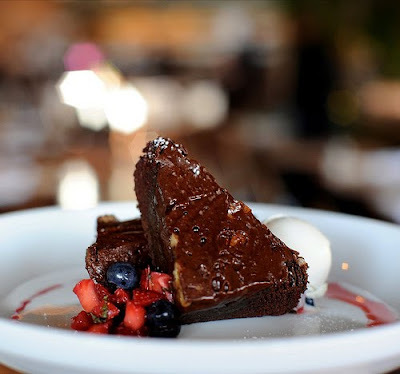 A $20, two-course lunch at the Washington locations offers diners a Texas Heirloom Tomato and Spinach Crepes with pecorino cream and hibiscus coulis followed with your choice of Individual sized Mom’s Chocolate Cake, Housemade Sorbet or “Dulce de Leche” Tres Leches. At the Village Location start with“The Local Tomato” with House Mozzarella, Marcona Almonds, Good Olive Oil and Balsamic followed by Forest Mushroom & Ricotta Crepes with Pine Nuts, Fresh Peas and Carrot Purée before choosing a third course from the dessert offerings. You can also enjoy Benjy’s vegetarian offerings in the evening when dinner is offered at the Washington location. Start with Farmers’ Market Tomatoes followed by the Quinoa Risotto with oyster mushrooms, fava beans, sunny side up egg, roasted broccoli, and manchego cheese. (I had this dish recently and thought it delicious. It’s rich and savory, with liberal use of manchego enhancing the fatty flavors of the fried egg.). Finish the meal with dessert. One of the great equalizers in the search for restaurants that offer fulfilling choices for people with diverse dietary preferences is Italian cuisine. At Arturo’s Uptown Italiano a $20, three course lunch includes your choice of House Salad (sans Pancetta) or A Cup of Cream of Yellow Bell Pepper Soup followed by Bowtie Margherita Pasta tossed with tomatoes, fresh mozzarella and basil with Raspberry Sorbetto for dessert. Another alternative for Italian is Grotto Westheimer where you can choose from Potato Gnocchi with a savory sage sauce or a Chiffonade of romaine & iceberg lettuce with spinach, hearts of palm, Roma tomatoes & cucumbers or Tomato Basil Soup. Follow your starter with Risotto Primavera – A blend of risotto, carrots, zucchini, squash, Roma tomatoes and pomorollo sauce, served with Italian bread & focaccia. After all that, you’ll have to choose the Tiramisu or Strawberry Cassata to eat later. The Backstreet Cafe gets rave reviews and was the site of our wedding reception. Consider this a must stop for restaurant week! Backstreet Café is making an effort to embrace vegetable-loving patrons during lunch where you can enjoy Conchiglioni stuffed with spinach, mushrooms, pine nuts, rustic tomato sauce followed by your choice of Almond Pound Cake with citrus infused with hatch chili pepper marmalade and chantilly cream, Rustic Crisp with Anjou pears and lychee sorbet, Dark Chocolate Cake with house made chocolate ice cream and raspberry sauce or Mexican Vanilla Crème Brûlée. Nearby in the Montrose, visit Canopy for lunch. Choose between the Chilled Spicy Cucumber-Avocado Soup with Crispy Wontons or the Canopy Salad with Mixed Greens with Asparagus, Fennel, Haricot Verts, Carrots, Onions, Tomatoes, Parmesan and Croutons in a Dijon Vinaigrette for your first course and finish with the Wild Mushroom, Broccolini, Leek and Gruyere Quiche served alongside mixed Greens and Quinoa-Couscous Summer Salad. I recently had a this entree at an intimate brunch with K at Canopy. They have a wonderful list of cocktails appropriate for early afternoon consumption on particularly lavish days. They also have a TV visible (and, in my opinion, unnecessarily other than to entertain staff) from both areas of the dining room. Cannopy's almost serene dining room sports a very cool wooden roof treatment to make the modern space feel more intimate. It's a nice match for foods presented with distinctive southern flare. In the evening you can return to Canopy and switch your second course to a Vegetarian Plate featuring grilled mushrooms, Texas Sweet Onion-Roasted Red Pepper Phyllo Triangles, Orzo Pasta Salad and Spinach Feta Dip with Grilled Flatbread. I am really hoping to stop in to try this one. (Let me know if we should make a dinner date or at least tell me about it if you go, pretty please!) To finish off that rich-sounding selection, choose from (city-wide go-to pick of southern old-time favorites) Peach Shortcake, Lemon Ice Box Pie with Blackberry Cream, Grapefruit Coulis, Candied Lemon Zest or Chocolate Raspberry Cake made of dark Chocolate Cake, Raspberry Buttercream, Ganache and Berries. If you’re looking for some south of the border vegetarian love – or a downtown spot – look no further than Cielo Mexican Bistro. For $35 you can choose from the Cielo House Salad with baby field greens, sun-dried figs, pea pods and cherry tomatoes tossed in roasted hazelnut vinaigrette, delicious sounding Avocado Rolls concoted of fresh mashed avocado, rolled in a flower tortilla with fresh cheese, deep fried & served with maple chili sauce or Butternut Squash Soup. (Semi-sweet homemade creamy butternut bisque toped with candied pecans & a drizzle of balsamic reduction). Just this list of starters makes me want to bring a friend so I can try two! I’d follow up with Mushroom Tamales served with Cielo rice and your choice of charro, refried or black beans before spooning up one of my favorite meal closers: home made tres leches cake, served on a bed of condensed milk cream garnished with whipped cream & fruits. As Gridskipper reports: "British ex-pats James Silk and Richard Knight rode into Houston with a nose-to-tail menu inspired by St. John in London and set up shop in the funky Montrose neighborhood. The effort has paid off handsomely for Feast and Houston's adventurous diners." If you’ve just heard about Feast, but haven’t dined there, you may easily have the impression that it is, as a nose to tail establishment, not a place for vegetarians. However, each time I’ve been, they have offered generous, filling and surprising vegetable centered entrees. “The most interesting food in Houston, in Texas, maybe even in America,” as it’s been called by Houston Chronicle food critic Alison Cook, appears to be doing the same again for Restaurant Week 2010. Vegetarian diners should enjoy a Salad with Romaine, Cucumber, Radish, Celery, Herbs and Raisins followed by a Stuffed Eggplant with Lentils, Mushrooms, Tomatoes and Cheese before choosing between decidedly British offerings including Sticky Toffee Pudding and Bread and Butter Pudding. Houston is, as you well know, a diverse city with an abundance of wonderful Asian offerings. However, while pescatarians can enjoy Houston Restaurant Week in nearly any of the participating establishments, vegetarian diners are more restricted – especially at steak and sushi houses. A great exception is The Fish Houston in mid town. There diners receive an impressive four course meal where vegetarian guests could select from miso soup with mushrooms, green onions, seaweed and tofu or a house salad of mixed greens, parmesan cheese, grape tomatoes, cucumbers and wontons before a spicy edamame dish sautéed with garlic, shallots, and chili oil or steamed edamame tossed with sea salt and their choice of specialty roll. Of course, to top it all off is a very decidedly unexpected series of desert options: crème brulee, banana tempura, bananas foster or mochi ice cream. The old Antone's location is a modern setting for a fun dining experiences. It's apparently the site of a wedding reception for another Houston couple that married in the Rothko. This pic was captured by Kelly Niemann. For your entree, enjoy Three Onion Bread Pudding made of Braised Leeks, Ricotta Cheese and Fresh Arugula before sharing Chocolate Brownies with Almond Brittle and House-made Strawberry Sorbet or any of a number of other sweet and savory offerings with your luck companion. Also in the downtown area is The Grove Restaurant. I think it’s a great place for a Sunday brunch (followed by a wander through the Discovery Green farmers market organized by Urban Harvest. Vegetarians will want either the Hummus Plate with seasonal & local vegetables or the Local Arugula + Figs salad with blue cheese, spiced pecans before their pick of the Veggie Sandwich w/ Roasted Peppers or the Wood Grilled Vegetable Skewers served alongside saffron cous cous and smoked paprika sauce. Well, that should be enough to get you eating for a few days. Bon appetite and happy restaurant week(s)! Thanks for illuminating us on all the wonderful veg-friendly fare in town! I’ve missed T-bones and Tofu! Thanks for being a loyal reader Lorien! Hoping to get back on track with regular posts, starting with this summary of Houston Restaurant Week. I can’t believe all the great options for vegetarians from some of our amazing establishments all over the city. Thanks Lucinda. As anyone who has ever had the struggle of extra curricular commitment knows, sometimes the best ideas are thwarted by other responsibilities. But it’s incredibly nice to know someone reads this thing. Right now the hubby and I are off to Feast to try their vegetarian Restaurant Week offerings in person. I’ll report in soon! I will be looking forward to reading about your experience! This list is great–just wish I had it last month when I was visiting Houston (my hometown)! While there I ate at Backstreet and at a wonderful casual spot, Jenny’s Noodlehouse, a family run restaurant which had a plethora of delicious vegetarian options. Thanks Christy! I should go to Jenny’s Noodle House more often. It sure is delicious!